Millwork is a tricky business. It is all about precision and creating the best from the scratch. This is the main reason why not everyone is good at it. It is more of like an art. An artist works for years to hone his skills. You might have heard about great artists who worked for months before concluding their masterpieces. Millwork is no less than an art. It is about imagination and creating the best from it. Wood is the canvas and millwork tools are like paintbrushes. The artist can mould the wood into whatever form they choose to. From creating furniture to carving wood into beautiful art forms, it depends all on the millworker. 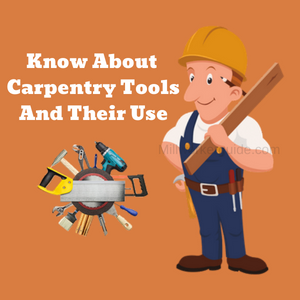 Tools and equipment of millwork thus play a crucial element when it comes to woodcarving. A lot of people do not get the desired outcome only because of improper selection or lack of proper knowledge about the equipments. From selecting the right equipment to utilizing it in work to finishing it properly, millwork can be a fun ride if done correctly. You just need the right things at your end. One of the important tools in millworks are nailers. This is the first tool you should own while beginning your millwork. In this article, we are going to acquaint you with nailers and the different types of nailers you can use in your work. What is nailer or nail gun? As we discussed about millwork being an art and tools being paintbrushes, a nailer or nail gun can be considered the primary tool or basic paintbrush of millwork. Without it, you cannot begin your work whether it is of any kind. So, get yourself a nail gun in the first place before starting your woodwork. You always need something to create a hole into your wood or drive nails into it. That’s the crux of woodwork. Well, nail guns are designed to serve the very purpose. Now, let’s first of all discuss a little about it. A nailer or nail gun is a type of tool that is used to drive nails into the wood. It first came into existence in 1950. Imagine how difficult it would have been to create a hole into the wood without a nail gun before 1950? Nail guns utilize fasteners which are moulded onto the head pin to ease the driving force into the wood. These can be used for a variety of purposes. The smallest size of fasteners available is 23 gauge which is 0.025 inches in diameter and called a “pin nailer” because it has no head. These are used for attaching beadings, mouldings in furniture and also in crown molding and casing. The next size available is 18 gauge which is 1.022 mm in diameter and is generally called as the “brad nail”. These are also utilized in fastening and also trimming hardwoods. These can be found with head or without head. The presence or absence of head depends entirely on the manufacturer but the efficiency is not compromised in both types. The next in the category is 16 and 15 gauge which is 1.63 and 1.83 mm in diameter respectively. Both of these are called “finish nails”. As the name suggests, these are used in general fixing or MDF trim works or providing a finishing to the wood piece. The largest size of conventional fastener is the clip head and full head nail which is utilized in framing, fencing and other exterior works. These have a diameter of about 2.9-3.1 mm. The size of diameter, again, depends on the manufacturer and a smaller diameter can also be expected. Different types of angles including 20 to 21 degree for full head or 28 to 34 degree for clipped head can utilized. The type of angle depends entirely on your application. 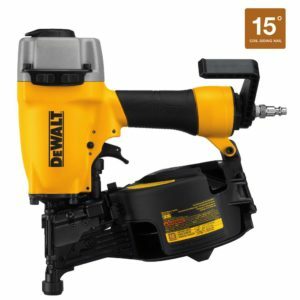 In the past few years, the DIY market has given a rise to the woodworking industry and plenty of nailers are in the market. 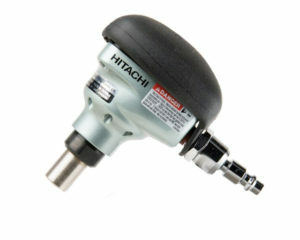 However, a lot of people are unaware of the type of nailer and its application which in turn affects their work. So, before putting your hand on the nailer know about its type and the range of application it offers. The size of gauge matters and in the same way the right type of nailer also decides the fate of your work. You cannot use one nailer for your every project. Now, you are aware with the basic use of nailer. Let’s dig more into it and learn about its types. You will be amazed to know that nailer guns are available in numerous types depending on their application. Different nailers serve different purposes and it is not a rocket science which you cannot comprehend. Just a basic knowledge about each type will make it easy for you to select the right nailer for your purpose. The first category of our nailer is the basic one which is almost needed by every woodworker for variety of works. Their categorization is mainly based on the type of work they perform. So, you can easily make out your choice by focussing on your type of project. You know the basic work of nailer, that is, to drive nails into the wood. Now, looking at the name, that is, the framing nailer, what is the one thing which strikes your mind? It has certainly something to do with wooden frames, right? Yes, you are absolutely on the right track. Framing nailers, also called as, framing gun is used in framing woods in mostly home building site. It is a high productive tool and provides a faster way of driving nails into the wood frame instead of a hammer. Generally, there are two types of styles which can be utilized while working on the framing nailer. One is, the through nailing while the other is toe-nailing. Through nailing is done when the nail square and wooden surface are perpendicular to each other. This is the most common style of framing nailer you should focus on. Now, there are times when the nailer and wooden are not perpendicular and need to be angled in order to drive nail. This is what toe-nailing is all about. It is all about driving the nail at a specific angle. 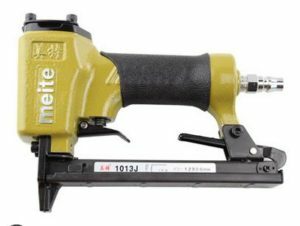 Again, there are two types of framing nailers, that is, the round head and clipped head. Clipped head are used for high volume projects because they can hold much number of nails while the round head can hold lesser number of nails. Flooring nailer, as the name suggests, are used for the very purpose of flooring. If you have seen a nail gun then you cannot identify or categorize flooring nailer as one of the nailers because of its different structure. The other nailers are designed for varied purposes while a flooring nailer is specially designed to deal with floorboards. The flooring nailers, are again of two types, manual floor nailer and pneumatic floor nailer. A manual floor nailer requires the muscular strength of the user to insert a nail into the floorboard while a pneumatic floor nailer is automatic and provides an additional force to ease the job. The application of nailer also depends on the type of wood utilized. Generally, pneumatic floor nailers are ideal for thick woods like Brazilian Cherry. 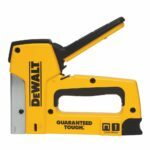 As the other types of nailers are somewhat versatile but the only drawback of flooring nailer is that it cannot be utilized for any other purpose except flooring. Now, this might be a little hard at your end because it does not specify the type of work it is used for but it does focus on the “palm”. This nailer extremely handy and can fit into the palm of your hand. You can consider it a miniature of nailer gun. It works in the same way as a nailer just on a smaller scale. It attaches to a compressor in the same way a pneumatic nailer does. This nailer is specially designed to serve in tight or hard to reach areas. The beauty of this nailer is its size. You might find other nailers a bit heavy on your hand but so is not the case with a palm nailer. It is handy and provides an ease of use. This nailer comes in three varieties, that is, pneumatic, electric and cordless. The cordless version runs on a battery and is more convenient than the other forms. 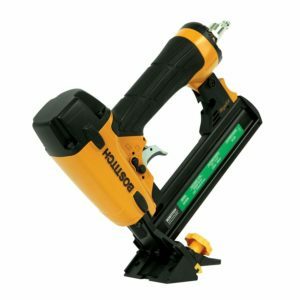 It is capable of driving nails between 1.5” to 3.5” long but heavy duty palm nailers are also available in the market. The first one is the spring nailer which makes use of spring to drive nails into the roof. The second one is the pneumatic nailer which works on air compressor system and is the most popular choice among millworkers. The third type is Solenoid nailer which works on the mechanism of electromagnetic polarization. Just like flooring nailer, roofing nailer is also not versatile and is only used for roofing purpose. As the name suggests, a siding nailer is used to install sidings. 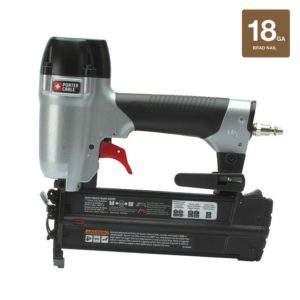 If you want to join thin pieces of wood into a big wooden mount then this nailer is the right choice for you. Just like a framing nailer, a siding nailer is mainly used for joining larger pieces of wood. These utilize shorter nails between 1-1/4” to 2-1/2” with wider heads. Some of the models are seen compatible with aluminium and thus are suitable for aluminium siding. 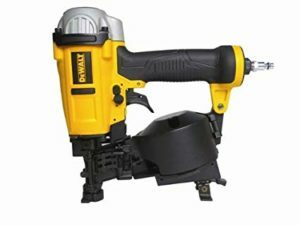 Just like Palm nailers, Pin nailers are also small in size and are used for finishing projects in woodworking. These nailers are compatible with 23 gauge headless nails and look like pins. Hence, the name pin nailer. Brad nailers are the same as Pin nailers. These are also used in finishing works and thus creates a lot of confusion among the millworkers. It is always a tough job to choose between a pin nailer and a brad nailer. As pin nailers are only compatible with 23 gauge but brad nailers are compatible with larger nails, that is, 18” gauge. Agreed, a 18 gauge needle is also small compared to the other nails used but it is relatively larger than the one used in pin nailer. Also, a brad nailer provides more holding power. As these nailers seem superior than the pin nailers. Hence become a go to choice of millworkers when it comes to finishing projects. Just like Pin and Brad nailers, finish nailers are also used for finishing projects. However, these are required to be used only with a specific sized nails. These are often used for crown moldings and baseboards. 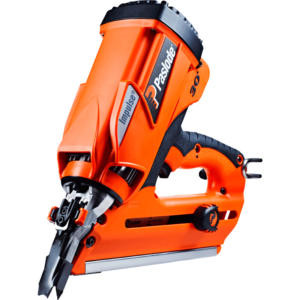 Pin and brad nailers are small in size and can only handle smaller projects but a finish nailer can handle bulkier and larger projects. Finish nailers are compatible with 15-16 gauge which are higher than brad nailers. Upholstery: these are used to attach fabrics to sofas or chairs. 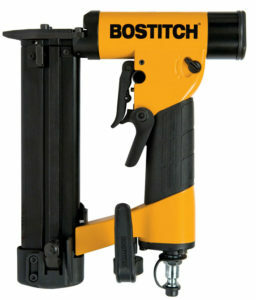 A cordless nailer works on the battery and can manage a wide range of applications. From punch lists to interior trim carpentry, a cordless nailer is just suitable for any type of job. 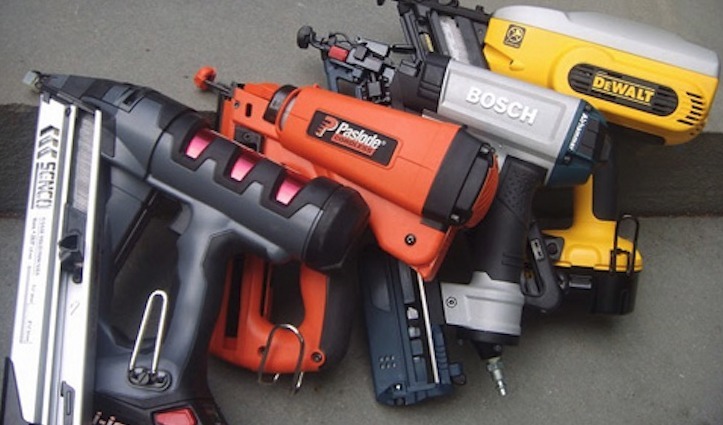 Cordless nail guns are available in framing, flooring and roofing nailers. 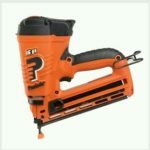 The popularity of cordless nail gun is on rise because the inclusion of battery makes it much comfortable than the other ones. Pneumatic nail guns work on air compressor mechanism. This nail gun has a piston cylinder which draws air to the gun from atmosphere. If you need to drive thick nails into the wood then pneumatic nail guns will be the right choice for you. These are not as simple as a cordless nail gun because you always need a bulky air compressor to perform the job. These are also easy to handle nailers after cordless nail guns. You do not need an additional bulk of air compressor which renders it light weight. If you are beginner then this one should be the right choice for you. It is also noise friendly and does not produce any noise like in pneumatic nail gun. Apart from this, this nail gun is also affordable and thus suitable for newbies. 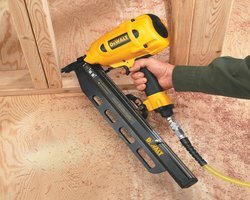 Air nail gun is same as pneumatic nailer and only works if there is compressed air. It can nail up to 40 to 60 nails per minute. The nailer works on a pump which is required to be filled with air from time to time for restricted working. You can also use an oil compressor for home purpose. Battery powered nail gun is similar to air nail gun but it is devoid of compressor hassle. An inclusion of internal compressor in the device makes it preferred choice over air nail gun. These are also versatile and can be utilized for variety of woods including hardwood and softwood. Trim nail guns are especially suitable for hardwoods. Working on hardwood is always a job but a trim nail gun makes it easier by drilling right into it in front of your eyes. It allows you to hold mold precisely at the right spot while nailing. 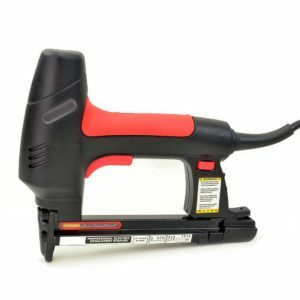 You can consider coil nail gun as machine gun bullet. There is a coil loaded in the device which can hold up to 100 nails. You can use it for variety of purposes including framing and non-framing projects.